EE-HUB experts and partners, together with EU officials were invited to discover the latest developments in the field, as well as the EE-HUB’s achievements since its establishment in 2015. The event was also the occasion to present the EE-HUB policy recommendations, clustered in target groups: EU institutions/bodies, educational institutions, national governments and businesses. These were identified by the EE-Hub network as the prerequisite to achieving 25% penetration of entrepreneurship education in classrooms by 2030.
Business and European institutions are referenced in the document as key players. Representatives from both were therefore invited to present their initiatives in the field to underscore why entrepreneurship education matters. Silvia Boschetti, EE-HUB Expert and Head of Communications and Public Affairs at Citi Italy, shared Citi’s strong commitment to entrepreneurship education, giving examples of the activities that drive impact on the ground, highlighting that the business community cannot move forward alone. She insisted that the successful implementation of entrepreneurship education programs requires strong commitment and support from governments and educational institutions alike. In response, Claudia Fusco, Head of Environmental knowledge, Eco-innovation & SMEs unit at DG-Environment (European Commission), explained how entrepreneurship education is supported at EU level, as a horizontal priority - related to several key policy areas - stressing the importance of making this mindset evolution in order to boost jobs and growth in Europe. Finally, this round table was the opportunity to launch the ‘Switch On Europe’ campaign. ‘Switch On Europe' is designed to raise awareness of the importance of entrepreneurship education for young people and to make the EE-HUB stand out as the leader and go-to place for European entrepreneurship education. 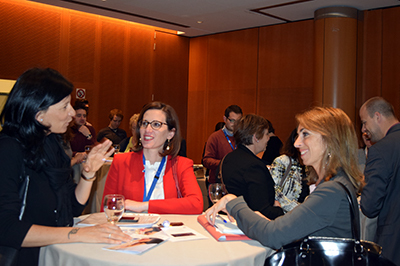 After the action taken on 25 April, policy-makers and business representatives discovered the virtual map showcasing those decision-makers and companies who are committed to developing entrepreneurship education in Europe. MEPs Michaela Sojdrova and Vladimir Urutchev, both prominent supporters of entrepreneurship education, took the floor and presented how coordination at both EU and national levels is crucial to increaseg youth employment and entrepreneurship in their countries.